This map was published in Amsterdam aftermath the great fire of 1666. The title in a banner at top right, flanked by City and Royal arms. 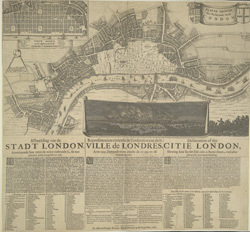 The design for rebuilding the City is inset in a panel at top left, with an engraved view of the fire in a banner at bottom centre. Below the plan is a description of the fire in Dutch, French and English with a key to streets and buildings.